What drives the love affair between cars and watches? Is it the mutual obsession with wheels, gears and torque? With precision and performance? Take a look at some legendary car-and-watch partnerships, watches inspired by cars, and the legacy of watches and racing. If we missed your favorite, let us know. With its “rocket tail” crown, chunky rounded profile, and three-gauge dial, the Cartier Roadster couldn’t look more like the sportscars that inspired it if it came with a stick shift. 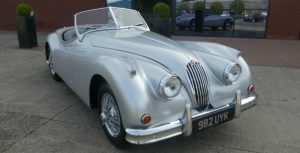 Note how the inset screws on the lugs of this Ref 2510 mirror the headlights on the Jag. If that’s not sporty enough for you, Roadster dials come in “Vegas” and “Porsche” . Cartier no longer makes the automatic Roadster watch, so look on the pre-owned market. Find a similar ref 2510 here. One of the most exclusive partnerships between a car company and a watch company is the Breitling for Bentley. It started in 2002 when Breitling created a dashboard clock for the Bentley Continental GT. (Read more). They found a mutual passion for precision and as a result, Breitling teamed with Bentley for a series of auto-inspired pieces. This Breitling for Bentley Motorsports Special Edition Ref. 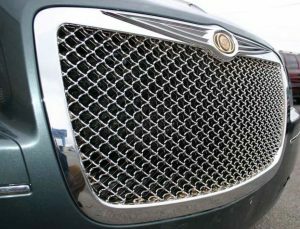 A25362 was made in British Racing Green to honor the Bentley Crewe – note the British Racing green and the knurled bezel, which mirrors the signature diamond Bentley grille design. In one of the most satisfyingly integrated partnerships, Mercedes and IWC came together in 2004 to create a watch and a car that complement each other’s design and precision. Mercedes created the CLS 55 AMG “IWC Ingenieur” limited to only 55 models. Among its exclusive design elements, the instrument panel matches the type style of the IWC watch dial, the edge trim matches the watch case – and note the IWC logo on the analog clock, lower left. For its part, IWC created the limited edition ref 3227 shown here from our portfolio with a titanium bracelet to match the titanium body of the AMG. It has a red second hand and red highlights on the dial. The caseback is engraved with the partnership information. They have created several limited editions over the years, and the watch is usually available only to purchasers of the car or afterward on the pre-owned market. The TAG Heuer Monaco watch was made famous by Steve McQueen in the movie “LeMans”, but this chronometer is more than just a pretty dial. The tachymeter scale can be used to measure speed. Its bold, boxy masculinity stands out from the crowd. The Sebring International Raceway in Sebring, Florida is home to the 12 Hours of Sebring race. 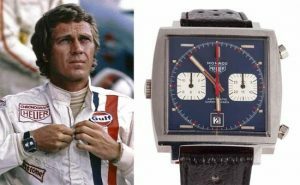 Although Rolex is the official sponsor now, it has inspired both a Tag Heuer stopwatch, and this unusual wristwatch from JeanRichard. The JeanRichard Paramount Limited Edition Sebring watch features an inset at the top right of the square dial instead of the numeral 1 that indicates the power reserve (48 hours) of the watch in a miles-per-hour format. It’s an engineering feat on the inside, too. A JR1000 automatic movement powers the square watch, which is crafted in brushed steel for sportier appeal. Of course for worldwide recognition and association with driving, look no further than the beloved Rolex Daytona. The Oyster Perpetual Superlative Chronometer Chronograph watches that comprise the Daytona collection are all about precision, form and function. This model is water resistant to 100 meters and features a tachymeter bezel for measuring speeds. With so much to offer in the way of car-related timepieces, you’re sure to find something that gets your heart racing.